Perform vehicle inspection taking pictures of items requiring action or attention and supplementing them with comments. The completed report is automatically uploaded to the shop’s Driveroo dashboard to be reviewed and edited by the service advisor and then shared with the customer. At the end of each vehicle inspection, Driveroo Inspector™ generates a detailed report that allows for instant repair job approvals. 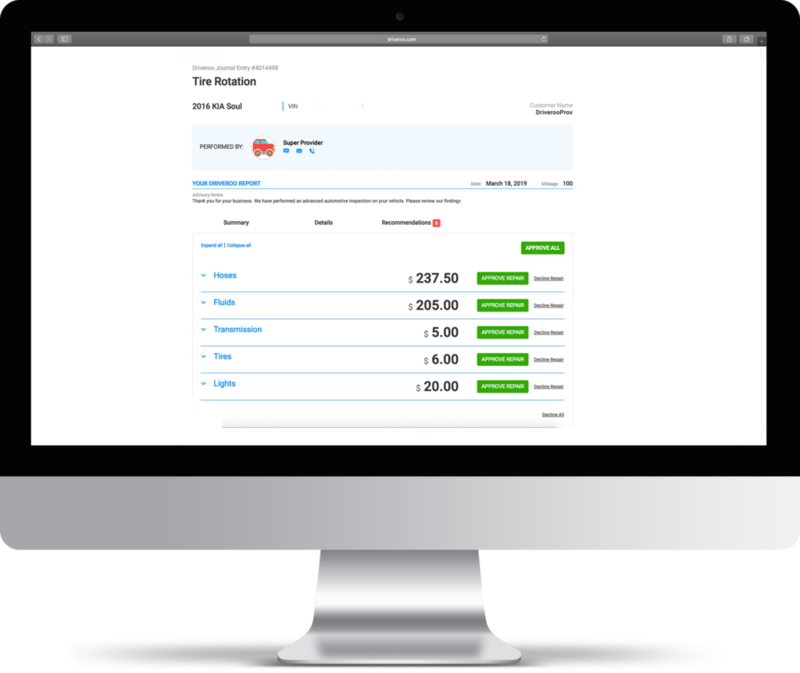 Driveroo Report communicates with descriptive images, consumer-oriented notes, technician recommendations, and cost estimates that translate into actionable approvals by the customer. Driveroo Report is the only one of its kind that allows customers to accept or decline repairs with a single click button. 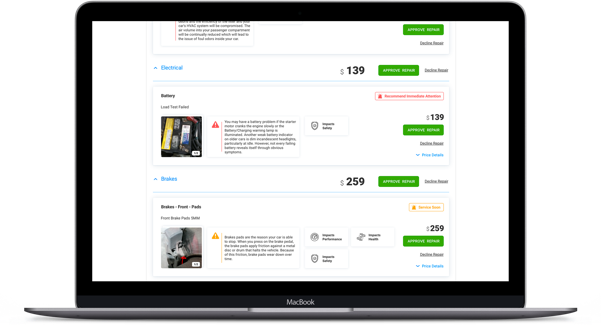 Each item requiring action shows an estimated cost of the repair and is supported by the mechanic’s recommendation, notes of the item’s importance, and pictures. The customer can make repair decisions without delay right from their phone. Present vehicle condition report to the customers in the form of a familiar online shopping cart. Customers can approve, decline or postpone individual repair services depending on their level of importance and cost. Service advisor reviews the inspection report and then shares it via a link with the customer, who then accepts, declines or postpones repairs right in the report from their phone. THE APP HAS A GREAT START.